You were quite a hit helping him out at work! "Family Friendly" is a hot buzzword when it comes to employers, but the music store that Daddy works for truly lives up to its "Family Friendly" promise! All parents should be so lucky to work for locally owned family businesses who are as flexible and who genuinely embrace their employees' entire families the way they do! 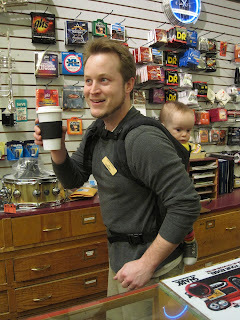 Yay, a babywearing daddy who loves music!! Thought I'd send some blog-wishes your way - Have a great New Year! And I'm super jealous of the family atmosphere at his work! That would be amazing! Love the baby back packing! What kind of sling is he using? I totally need one that's easy to backcarry with...C can climb out of the hiking backpack and while he still loves to be front carried in the Moby-wrap, Mommy can't do it for long...and I can't quite figure out the back-carry.